Sage and I go ways back, even before we knew each other. We accidently bumped into each other … oh.. maybe 8 Thanksgivings ago and back then who knew that we would become winter buddies. It started on a somewhat unplannted note, when sage entered my life with many other ingredients, but it now has its own exalted status as my winter herb of choice. For a passionate cook like me, Thanksgiving is a dream holiday! Once you dispense with some history, let’s face it, it is all about food. If like me it is a holiday you adopted, well, halfway into your life, it is about creative food. So, while now several Thanksgivings later, I do have some Thanksgiving staples, this was not the case with my first Thanksgiving. Almost a decade ago, Thanksgiving for me was much like a feeling like a kid in a candy store, I shopped and shopped and shopped… and then I cooked and cooked and cooked. Well, this particular Thanksgiving eight years ago, my husband has some strange hives and the allergist asked him what he ate.. He looked at the doctor rather helplessly and I had the task of compiling my food shopping spree! While we never did get to the bottom of those hives and thank goodness, they have not surfaced again, I did realize that the feathery herb that helped create my killer leftover turkey dish was sage! 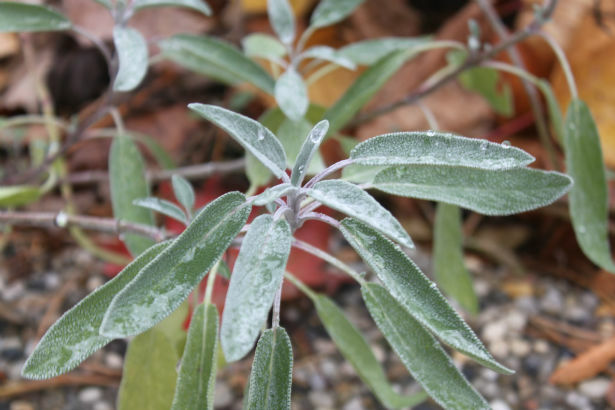 Since then we have grown our own sage, and let me tell you this is one amazingly strong herb, it survived all the four seasons of the New York winter without complaint! In fact, in this picture, it has flakes from last weeks snow. It does not like much competition in the flavor department so I tend to pair it with complimenting spices.It is said to have a savory, slightly peppery flavor. It appears in many European cuisines, notably Italian, Balkan and Middle Eastern cookery. I have found that it pairs well with squash and with turkey. This week, I have used it a rather unconventional turkey recipe and will someday share with you my roasted squash, sage and Bengali five Spice recipe. Previous ArticleSpices and Seasons – Saucy Sage and Cardamon Turkey!